Sometimes, I have quite an issue with ingredients. I read somewhere on the internet about meyer lemons or fiddleheads, and when I go to get it, there’s none, nowhere – at least nowhere that I look for it. I passed nearly the whole last winter hunting down some cima di rapa without any success, and since we started this English language blog and get to know many blogs all over the world, I find myself in urgent need for ingredients that might be sold around the corner in San Francisco, Mumbai, or Brisbane, but not in Berlin. Thank you Uda, for making these beautiful badges! And thank you for being a never ending source of ingredient’s inspiration to me. All of you are most welcome to join us and invent a nice recipe with some olive herb involved! In case you have never heard of this: I had some difficulties to find out the proper English name for it, and for „olive herb“, there are indeed few hits on the internet. It’s part of the santolina family which comes up with many appendix names, and not all varieties seem to be eatable. But olive herb definitely is – it tastes of pickled olives and looks like a funny hybrid made of a fern and a bonsai conifer. Ok, make a blog post with your recipe in it (or do as many blog posts with as many recipes as you want – there’s no restriction), add one of the badges above in that post and leave your link in the comments of this post or here on Uda’s blog until July 31st. Please note: the badge doesn’t come with a code which means that you need to download the image and add a link to this or Uda’s post by hand. We look forward a lot to your contribution! There will be a little round-up with all of your and our recipes in the end that we will show on both blogs. That’s all? Yes, that’s all – there are no prices and no awards, it’s just for the fun of it. We hope you enjoy it! There’s another fun to have – with today’s urban shot. It’s as orange as an urban shot can be, and I tell you, it’s not staged (at least not by us ;-)). It might not show at first sight, but there’s a double connection with olive herb. First of all the moment of surprise: a herb tasting of pickled olives is as unanticipated as an orange umbrella arranged thoroughly in an orange trash can. You just don’t expect either of it. And second, the color inspired to me to do some orange colored recipe as a first inspiration for the event. There’s hardly a recipe needed because it’s that simple and I do it quite often. 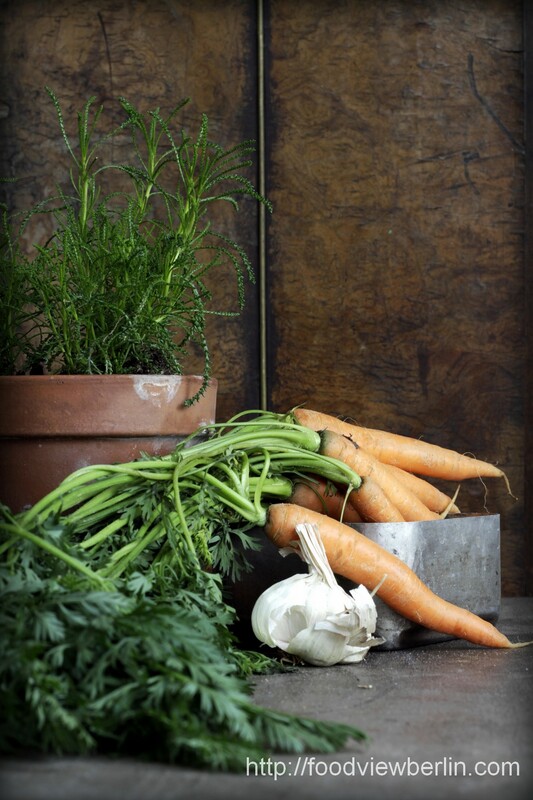 Clean a few big carrots (you need approximately 3 for one serving) and slice them into spaghetti shape. There’s a special gadget for this, but you can also use a potato pealer. Cut some garlic cloves into not too fine slices. Take off some twigs of the olive herb plant and clean. In a small pan, heat few olive oil, add the herb, add some brown sugar and let caramelize. Take off and put aside. In a big pan, heat some more olive oil, add the garlic and as much chili flakes as you like (I like it not too hot). Stir for a moment until the garlic get’s a bit color. Take off. 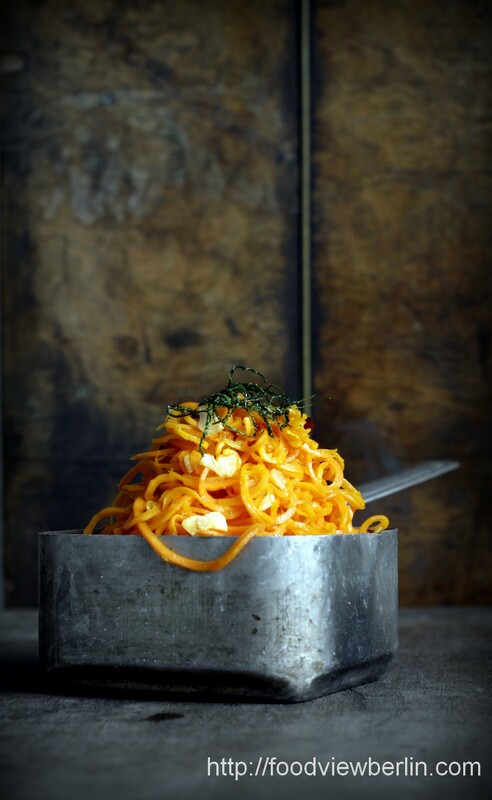 In the same pan, stir the carrot spaghettis and let get a little color as well. Add the garlic and chili flakes, salt and pepper to taste and mix well. Done. Serve with the olive herb, and if you want you can also add some parmigiano. And now it’s your turn. Hope you join us! And I want this gadget now! A slicer, what a marvelous tool, will hunt that down as well. 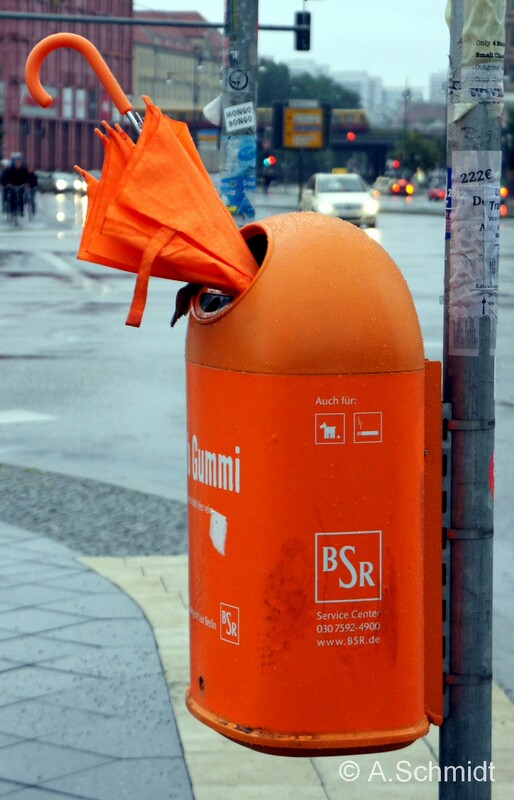 Thanks for the inspiration, invitation and the bright orange making happy in rainy weather pic! You’re welcome :-)! I wish you luck to find both the herb and the slicer. Those slicers are really fancy and helpful, it’s a sprial slicer with three different typesof razor, one for Radi, and two for vegetables in ither spaghetti or talgiatelle shape. It’s nice for potatoes also. Wow! These pictures are georgeous again! And your recipe is sowas von nachkochenswert! Das macht Lust auf das Event, toll! Vielen Dank für deine Idee und Eva, bringst du mir noch Olivenkraut mit, ich fürchte, ich brauch noch mehr! Thank you, Uda! Der Dank ist ganz meinerseits – und wie wunderbar dass ihr zwei, Du und Eva, euch bei Olivenkraut-Versorgungs-Engpässen gegenseitig helfen könnt ;-). Gorgeous recipe and pictures, comme toujours, Claudia! If you don’t find those ingredients in France, the land of any delicacies, how can I do so in Germany ;-). What a nice idea…..maybe I can manage to participate. Oh yes, please! You’re welcome! Great that you mention the pot! I love it as well. You’re right, cima is just Rübstiel – which I could not find either. Maybe I should just grow some myself next season ;-). I’m excited to see what you will do with olive herb! Wish you luck to find it – in the garden corner of DIY markets you might indeed have luck, also on bigger food markets (at those market stalls that are specialized in herbs). Puree sounds wonderful! In case that I find cima at all next season, let’s have some exchange about its many uses :-). Hello from my hotelroom in Bavaria – there’s just few minutes time before teaching craftsmen on socialmedia 😉 Olive herbs. Never used by now. But I’ll try it – just spotted at my favorite herb-monger. I will buy some plants for my garden. Thanks a lot for your idea and your wonderful looking carrot spaghetti!!! Thank you, Antje! I knew that you would join us :-). Already excited to see what you will do wih the herb. I bought it at a garden store next to Mauerpark. I forgot the name, but you can’t miss it – it’s on the left hand side once you entered the market area through its main entrance. Would be great if you get it there or somewhere else (I added some further tipps as an update to the event text above) – you are most welcome to take part in the event :-)! I found cima di rapa in Munich’s Viktualienmarkt, in May. I think it’s out of season now. And thank you for telling me what my slicer is for! It was a present and I thought it’s just a normal grating thing. Thank you for stopping by! Yes, cima is currently out of season. I can very well imagine that you got some at famous and gorgeous Viktualienmarkt in spring. Oh, yes, give your slicer a try! I don’t always use it, but I have my episodes with it, and when I got started, I slice and slice and slice any vegetable I can get :-). Oh ja, wir freuen uns sehr, wenn Du dabei bist, Julia! Ich bin mir sicher, dass Dir etwas Wunderbares dazu einfallen wird :-). This looks fantastic, Susanne! What an amazing summer treat – I feel like in the Mediterraneans already :-). Thanks a lot for your beautiful contribution! Olive herb lovers unite! I discovered it a while ago and wasn’t really confindent what to do with it. Now I know. Lovely, thanks! Great that you like it! Of course, you’re most welcome to contribute to our little event.